If he/she fulfils the financial criterion A.1 and one of the financial criteria A.2-A.5, either personally or through a legal entity/entities in which he/ she participates as a shareholder – in proportion to his/her holding percentage, or through investments done by his/her spouse or jointly. A high-ranking senior manager may apply, provided that he/she receives such a salary that generates for the Cyprus Republic tax revenues of at least €100,000 over a three year period which has already been paid or prepaid. The applicant should have made the necessary investments during the three years prior the date of the application and must keep the investments for a period of at least five years as from the date of the naturalization. It is understood that the investor may replace the investment during the said five-year period, provided that he/she has obtained beforehand an approval by the Ministry of Finance. If during periodical inspection, it is established that a criterion, term or condition of the Scheme has been breached, the granted naturalization may be revoked. The applicant should make an investment for an amount of not less than €2,0 million for the acquisition or construction of real estate properties, or for the construction of other land development projects (residential, commercial or in the tourism sector developments) or other infrastructure projects. Land under development is included in this criterion, as long as an investment plan for the development of the acquired land is submitted with the application. A Land in a building zone of zero development is excluded and is not considered an investment. The applicant can invest by accusation of companies or organizations established and operating in Cyprus with minimum of €2,0 million investment. For that purpose, there must be a specific investment plan according to which the invested funds shall be channeled towards the financing of the investment objectives of these companies. Investments in the shipping sector are now eligible on the basis of measurable criteria that will be determined jointly by the Ministry of Finance and the Shipping Deputy Ministry. The condition is that the companies or organizations have to prove physical presence in Cyprus, with significant activity and turnover and employ at least five (5) Cypriot or European citizens. The number of employees must increase, if more than one applicant invests simultaneously in the same business or company. 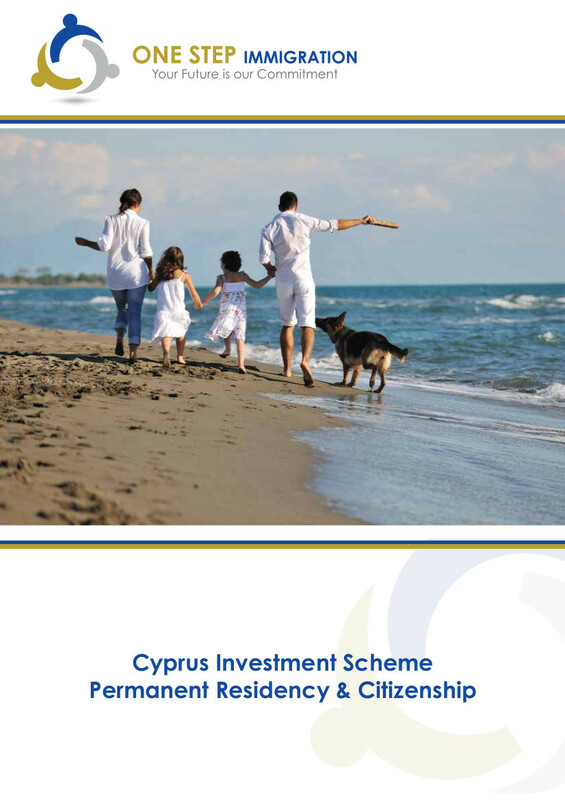 Minimum investment of €2,0 million for a period of at least 5 years in alternative investment funds (AIF) or Registered Alternative Investment Funds (RAIF) established in Cyprus, licensed and supervised by the CySec and whose investments are made exclusively in the Republic of Cyprus, in investments that meet the criteria of this Scheme or in areas approved by the Minister of Finance. It is permitted for these AIFs or RAIFs to invest in secondary market stock-market values of the Cyprus Stock Exchange an amount that does not exceed the €200.000.The manager or the auditor of the Fund shall inform on an annual basis, the Ministries of Finance and Interior for the value of the initial investment. The acquisition of financial assets of Cypriot companies or organizations for a minimum of €2,0 million, such as securities, bonds and bills approved by CySec, by companies with solid physical presence and activities in Cyprus, with the scope of financing them exclusively in Cyprus, based on an approved investment plan that fall under this criterion. The acquisition by an AIF or RAIF of units of other AIFs or RAIFS is not eligible. A combination of the above investments can also be made by the applicant, provided that the total investment will amount not less than €2,0 million.